Time: 7 hrs. 15 mins. The Lizard Head trail is located in the Lizard Head Wilderness Area of the Uncompahgre and San Juan National Forests near Telluride, Colorado. 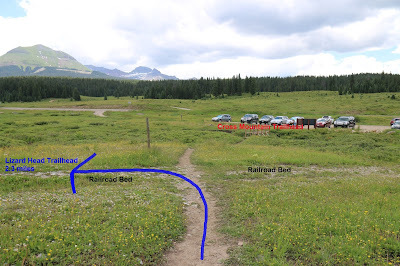 The trail begins at the Lizard Head trailhead about 12 miles southwest of Telluride where it climbs above the 12,000 foot elevation on Black Face Ridge. The trail continues west to a point just below Lizard Head Peak before descending into Bilk Basin where it comes to an end at the Wilson Mesa trail. Stunning views of the surrounding peaks include Lizard Head Peak (13,114), Dolores Peak (13,290), El Diente (14,159), Mount Wilson (14,246) and Wilson Peak (14,017). 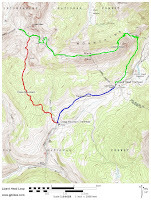 This post follows the Lizard Head trail to the saddle between Lizard Head and Cross Mountain Peak, where the trail descends into Bilk Basin, and then backtracks to the Cross Mountain trail which it combines with the abandoned railroad bed of the Rio Grande Southern Railroad to create one big loop. To get to the Lizard Head trailhead drive about 12 miles southwest of Telluride on Highway 145. 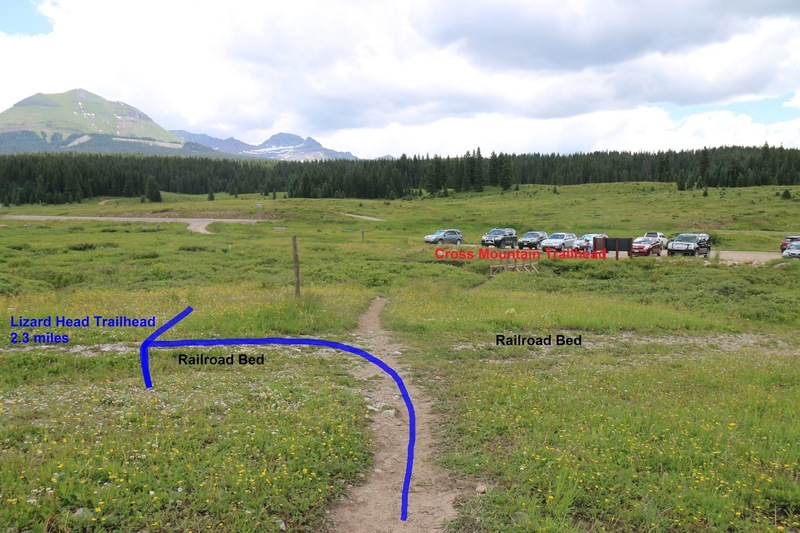 Parking and a restroom are available at the Lizard Head Pass Point of Interest interpretive area or just up the hill from it at the old Lizard Head trailhead. The trails from both parking areas join together after a short distance. From the trailheads the trail travels eastward across grassy slopes with waist high wildflowers and brush. Eventually the trail bends more northward and begins ascending a drainage on the east end of Black Face Ridge. Depending on the weather and the time of the year there may be several small streams and marshy areas to deal with. Near the 1.7 mile point the trail crosses the Lizard Head Wilderness boundary. The trail continues climbing and switchbacking its way up the drainage until it reaches a saddle and levels off a bit. Near the 2.4 mile point the Wilson Meadows trail splits off on the right. From the Wilson Meadows junction the trail begins climbing once more in earnest making use of switchbacks as it ascends to the ridge. Just past the 3.25 mile point the trail reaches the lower end of the ridge. It is still climbing at this point but at a much gentler slope. The trail crosses the highpoint of Black Face where the elevation reaches 12,146 feet. Lizard Head has a prominence of 1,135 feet with the top section forming a 400 foot tower. Information on the Forest Service website lists it as one of the most difficult climbs in the state of Colorado. As you can see from this closeup shot the rock looks pretty rotten. This is a closeup shot of Gladstone Peak (13,913). With our telephoto lens we could zoom in enough to see if anyone was on the summit. To its right is Wilson Peak (14,016) and to its left are Mount Wilson (14,246) and El Diente (14,160). Colorado's 54 or so 14ers (peaks that rise above 14,000 feet) are popular with peak baggers. The trio of 14ers here are among some of the more difficult climbs in the state. From Black Face the trail makes a big beeline descent to another saddle and then climbs back up to the south ridge of Lizard Head Peak from where it traverses around the south side. At the 6.8 mile point the trail reaches the upper end of the Cross Mountain Trail. From here you can continue following the Lizard Head trail to the right. An out and back to the ridge overlooking Bilk Basin adds about 8 tenths of a mile to the round trip distance. If you skip the out and back then the round trip distance for the entire loop will drop down to 12.1 miles. The elevation change for the out and back is minor so it doesn't increase the overall effort required all that much. The Cross Mountain trail is a moderately easy 3.3 mile descent across a few open meadows but mostly secluded by tall stands of conifers. There are small stream and creek crossings to deal with but nothing too bad. The old Railroad Bed crosses the trail just before the Cross Mountain trailhead. There aren't any trail signs that indicate that it is the Railroad Bed but it is an obvious visual observation. From here it is an easy (depending on how tired you are at this point) 2.3 miles back to the Lizard Head trailhead. 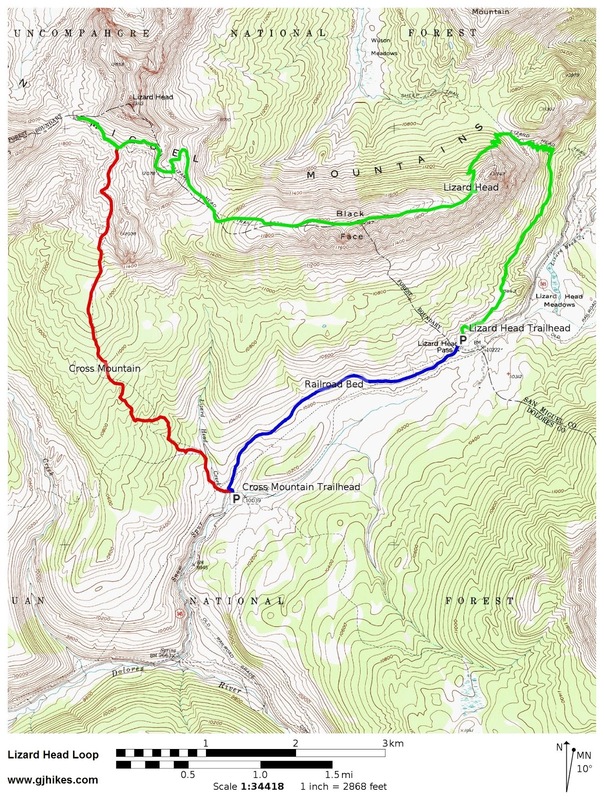 The overall elevation gain for the loop is 3,568 feet. The left hand side of the graph begins at the Lizard Head trailhead. The first highpoint of the graph is the ridge summit on Black Face which is above 12,000 feet. After that comes the big descent with the next highpoint once again reaching above 12,000 feet. The low point after that is the Lizard Head/Cross Mountain trail junction which is just below 12,000 feet. All together the trail gets above the 12,000 foot mark 4 times with 2 of them being only minor bumps. The right side of the graph is the Railroad Bed which as you can see has a minor uphill grade. While hiking the trail for this post in mid July, we were snowed on near the Bilk Basin overlook. All of the peaks above about 12,500 feet had a fresh inch or two of snow by the time we got back to the trailhead. Afternoon thunderstorms occur frequently in the mountains. Try to time your hike so that the part of it above treeline gets over early in the day. The Lizard Head Loop is a good trail that lets you explore a true wilderness area on a day hike. The high peaks of the San Juans are magnificent to behold up close and the Lizard Head Loop is a good trail to see them. If you would like to see it for yourself then all you have to do is 'Take a hike'.